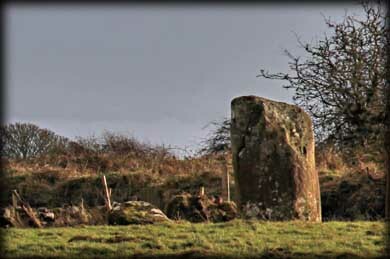 Driving back from Carrowntemple we decided to visit these two standing stones located at Doon. I thought it would be best to group these together as they are in adjacent fields. The land was covered with rain water and very boggy so we got as near as we could. 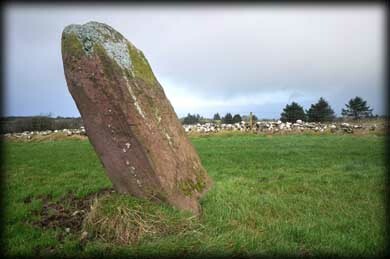 The first stone in the northern field is a large rectangular block standing at over 2 metres high and leaning to the Southwest. In the field immediately south of here and further in from the road stands stone two. This stone is also about 2 metres high. It may be one of a pair as there is another stone lying prostrate next to it. This stone may have split from stone 2, hopefully we will get closer next time we visit. Situated: From Tobercurry head east to Gorteen. Then head south. Turn right after Kilfree Post Office, then second right. The stones are up here on your right. Discovery Map 32: G6334 0240. Last visit Dec 2011.